Old Mr. Putter and old Mrs. Teaberry are neighbors. 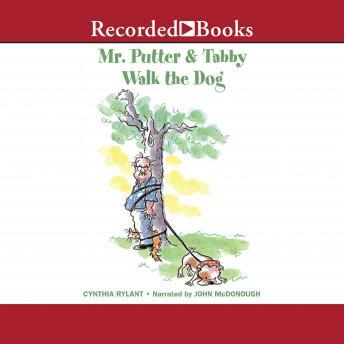 When Mrs. Teaberry hurts her foot, Mr. Putter and his cat, Tabby, offer to walk her little dream dog, Zeke, for a week. But Zeke is no dream dog. Zeke is a nightmare. On the first day, he drags Mr. Putter and Tabby through the neighborhood. On the second day, he wraps them around trees. On the third day, he chases big dogs until the big dogs turn around and chase them. If they don't think of a way to get Zeke under control, they won't make it through the next four days. Award-winning author Cynthia Rylant's amusing lesson on the power of positive reinforcement will bring a smile to any listener. John McDonough's jolly reading is perfect for this charming little book with the delightfully funny ending.